In case you haven’t already heard, Inner Space Stations are building you the best space station on planet Earth! That’s right, we’re redeveloping our service station on Hull Road. LAUNCHING APRIL 2019. We know that BP provide the best fuel in the market. At Inner Space Stations, we offer BP Ultimate Fuel for both petrol and diesel cars. BP Ultimate Fuel means that you can drive around with a clean, high-performing engine and enjoy a notoriously smooth drive. 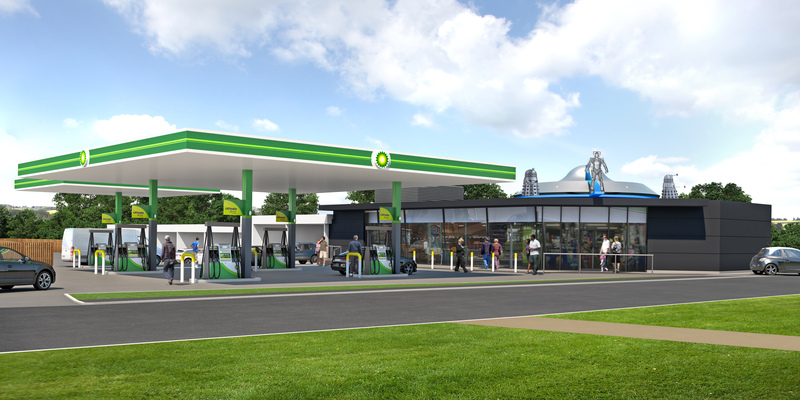 We have gone above and beyond to design an ultra-modern service station in York. Our team of Stormtroopers and Daleks have landed their spaceship on top of the building for additional security! We have extended the size of the shop to provide you with even more delicious food, alcohol and useful products so you can be confident to find whatever you need at Inner Space Stations. Whether you need your morning butty, a mid-afternoon snack or your evening meal, our new space station will offer a brilliant range of healthy fruit & veg, as well as a delicious selection of meals to go. If you’re anything like our team of Daleks, you will need your coffee fix to keep you going each day. We’ll be ready with our Costa Express machine and yummy selection of snack bars and chocolate! Brand new to Inner Space Stations Hull Road, Stone Willy’s Kitchen will offer hot food-to-go, 24 hours a day! Freshly made sandwiches and wraps, fantastic gourmet pizza and so much more! Don’t need fuel but still want to top up the kitchen cupboards for the next few days? That’s fine by us, we’ve created some shop parking spaces so you can ‘shop till you drop’ without worrying about the queue for fuel! 8. Best Customer Service in York! Of course, our fantastic team will greet you with a glowing smile every time you visit Inner Space Stations. We can’t wait to welcome you inside our new space station! Our popular Car Wash and Jet Wash facilities will still be available for all our customers to use. Did you know that our Jet Wash is more than just a ‘DIY wash’?! Oh yes, so much more… vacuum, screen wash, fragrance, air and tyre pressure! Inner Space Stations in York are more than just a service station, we also have award winning self storage in 4 different locations across the City! Our drive up containers at Hull Road are perfect for individuals and businesses needing storage for anything from 1 week to 1 year! And guess what… they start from only £20.00 per week! We would love to hear your fantastic ideas, so if you think we have missed something that you would like to see in our new space station, please contact us.